Toronto. You never heard of a Turmon? Well, where have you been? The little Turmon is nearly one century old! See the above Autumn 1987 Zeiss Historica article on page 7 by Joe Brown of Texas. In the mid 1800s a number of German optical houses were established. Their bread and butter products were microscopes. One house, Carl Zeiss, was established in the tiny university town of Jena. Zeiss was a clever businessman surrounding himself with serious scientific people who could make his products world renown. After the death of founder Carl Zeiss, the company expanded rapidly making all things optical or scientific. In 1921, the company began to market a tiny well designed and well made Turning monocular. 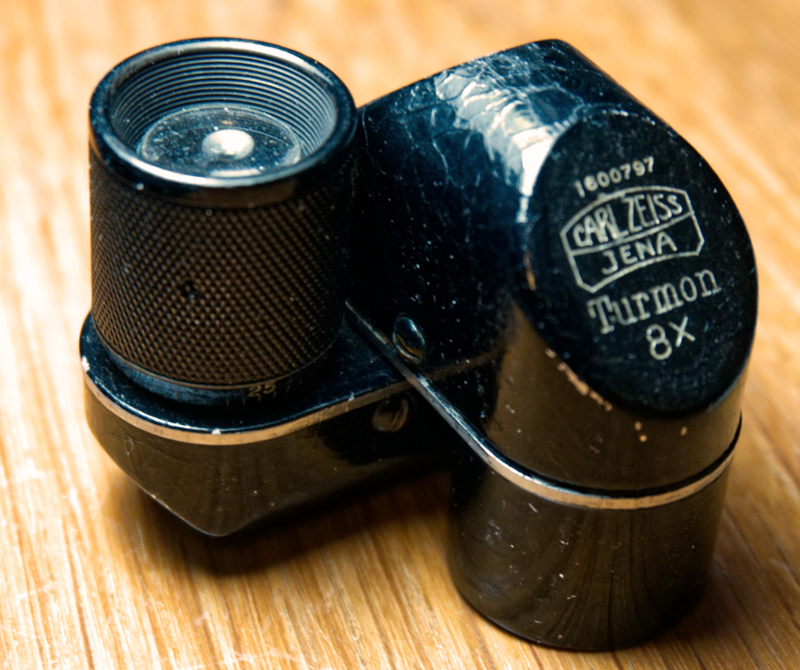 The little gadget was an 8x, 21mm diameter device code named Turmon. Easily unfolded to drop in a waist-coat pocket, the tiny device when folded gave a upright image correct from left to right thanks to the built-in roof prisms borrowed from a binocular. Five years after it was marketed, mighty Zeiss was tapped to bring order to the chaotic post-war German camera market and Zeiss-Ikon was formed. The second world war was not easy on Zeiss. Its camera business in Dresden was levelled in 1944 and its main factory in Jena went to the Russians at the end of the war. A western optical house called Docter Monocular made a look alike version of the tiny Turmon which was still being made by the East Germans in Jena. This entry was posted in history and tagged Carl Zeiss, monocular, Turmon, Zeiss Ikon. Bookmark the permalink.